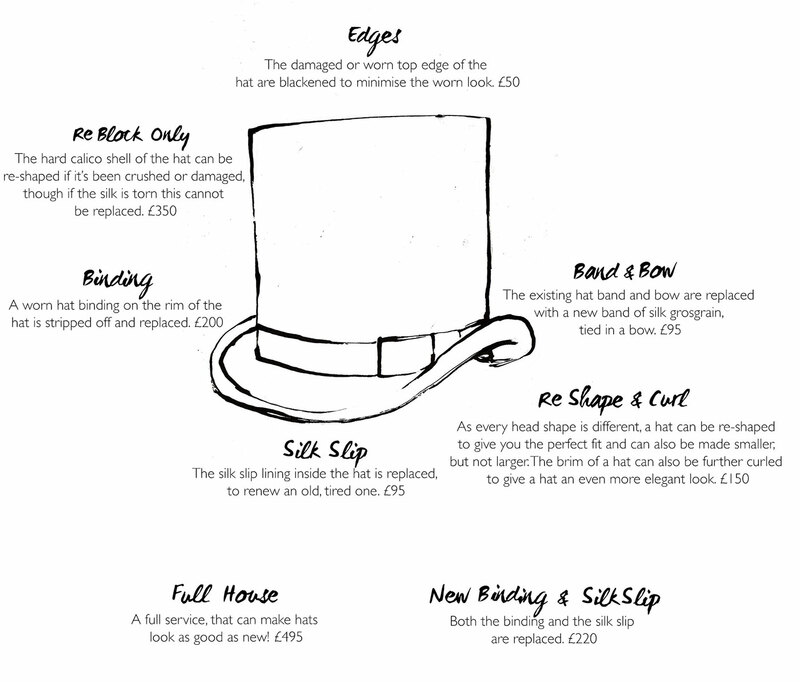 After repeated wear or before a big event, you may wish to refurbish your prized top hat to its former glory. Here at Oliver Brown we offer a cleaning and refurbishment service suitable for both antique and contemporary top hats. We’re lucky enough to work with one of only two specialists left in the world who can refurbish an antique silk top hat. We can carefully refurbish and repair most parts of the hat, or if you’ve inherited an heirloom top hat, we're also accustomed to altering the shape of top hat or making it smaller, to give you the perfect fit. However we're unable make the top hat larger and can't replace the the outer silk itself as it’s no longer in production. See full details of our refurbishment services below.